UPDATE Nov. 12 2013 : NO. 1 Noodle House is now closed – I think it’s now a pop up for Save-on-Meats restaurant as it regular location is being renovated. I know I’m guilty of taking some literary license when I write some of my meal reviews. I do try my best to limit the hyperboles and if I include them, I try to make sure they make sense in the context of the post. The collective power of online peer reviews is enormous. It’s old fashion word of mouth elevated and amplified to the point where it can push businesses to lofty levels of success or pull them down to utter failure within weeks of being opened. As a result I try to be as judicious and thorough as possible with my write-ups. I think most people do try to be fair but there are some that seem to lack the awareness of how asinine they sound. Enter youtube sensation, Real Actors Read Yelp (another reason I try to be fair – I never want to be featured in anything resembling a Real Actors Read Yelp video). They lampoon the ridiculous and nonsensical reviews they can find on Yelp. Number 18 is a favourite of mine (see below) simply because carrying change can be annoying. When I had heard a pop up Ramen shop was opening in Gastown, I was interested to see if I could get a quality bowl of noodles by my office instead a trekking to Jinya. Whether it was because of its association with Mark Brand, its name or the lettering & imagery (which has some cultural baggage) it used for the eatery, the knives seemed to out for No. 1 Noodle House. Once opened, the opinions expressed about the eatery across the various restaurant review sites ranged from mediocre to poor. Then I spotted the exaggerated review on Yelp that actually made we want to go to No. 1 Noodle House. I thought, “There is no way Mr. Noodles instant ramen was better than a ramen prepared by any restaurant!” I was on a mission to try No. 1 Noodle house. Sitting on the plywood picnic tables, across from some vintage pinball machines, my friend and I waited for our potato salad, deep fried veggie spring rolls and 2 No. 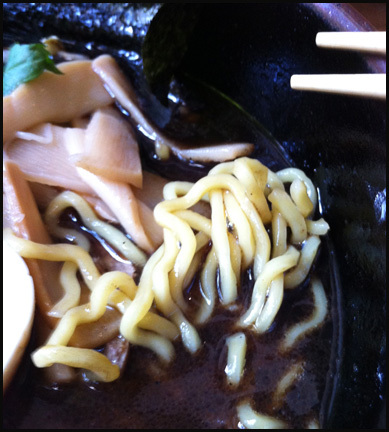 1 Black Ramens. 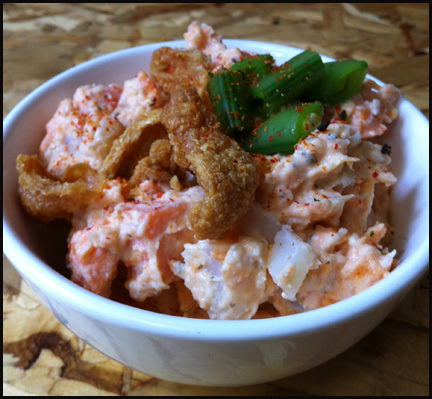 The potato salad was topped with cut up sweat peas and chicken skin crackling. What was interesting was the chunks of sweet potato mixed in with the regular potatoes cubes and the use of umeboshi (pickled Japanese plums). As a result, the potato salad was creamy and then had a slight sweet and fragrant fruity aftertaste. Definitely different than the savoury versions that I was accustom to and prefer. 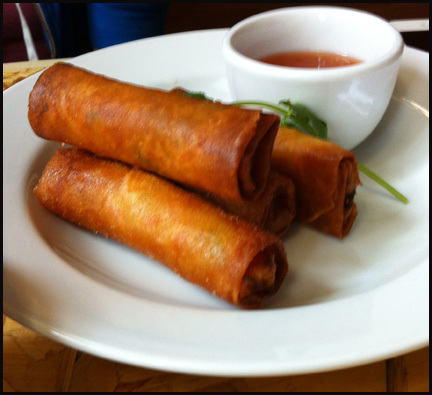 The vegetarian spring rolls were crunchy, filled predominantly with cabbage and were decent. They reminded me of the spring rolls from Westernized Chinese eateries that are not that common in Vancouver anymore but dotted the Canadian landscape in the 70s and 80s. Oddly the lettering and images that adorns the restaurant are similar to what westernized Chinese restaurants used back in the day and as a result these spring rolls seemed fitting for the place. Now onto the ramen, it came with 2 pieces of pork, arugula, nori, raw bean sprouts, bamboo piths, half a marinated egg and lots of garlic oil. 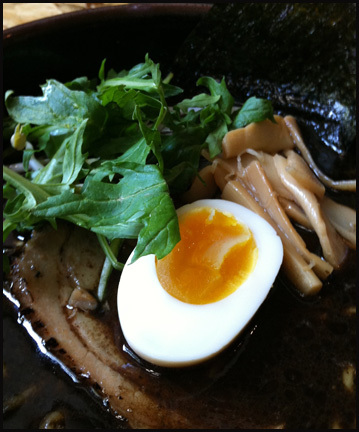 Despite the inclusion of salad rocket, this was a traditional ramen. The egg was cooked medium well but wasn’t marinated long enough and was bland. The al dente noodles are curly and very similar to the ones served by Benkei. When our ramen were brought to our table, the garlic oil was very aromatic. As you sipped the broth, you get a great initial taste of garlic but unfortunately any complex flavour to the soup was overpowered by the aggressive saltiness. The level of salt in the soup is tolerable when you are just eating the ramen. The bamboo piths and noodles soak up adjacent flavours which helps mask the aggressive sodium levels in the soup. I knew it was salty but didn’t realize how salty the soup was until I ate some of the potato salad and realize I could no longer detect the fruity, fragrant sweet aftertaste. The soup overwhelmed my palate. After eating at No. 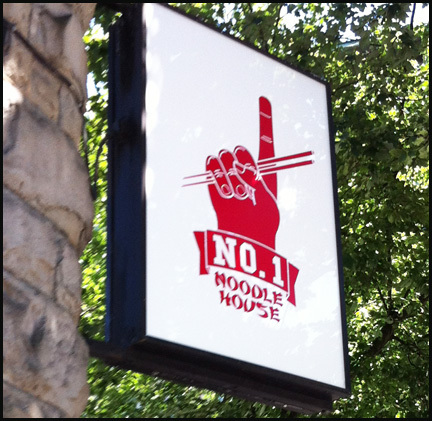 1 Noodle House, was the ramen worse than Mr. Noodle? No; it is not close to being worse than instant noodles. Is it among the top ramen served in Vancouver? No; the over salty soup (a very good way to drive beer sales by the way) and the misfire on the egg precludes it from joining the ranks of Santouka, Marutama & Jinya. I think it does deserve a spot at the back of the middling pack of ramen sellers in the city. However if it was a choice between No. 1 Noodle House ramen and Sapporo Ichiban, I would definitely pick the Gastown eatery’s ramen over instant noodles any day. PS: Here’s a link to more of those hilarious Read Actors Read Yelp reviews, here. The last video even features our local Vancouver Maritime Museum.